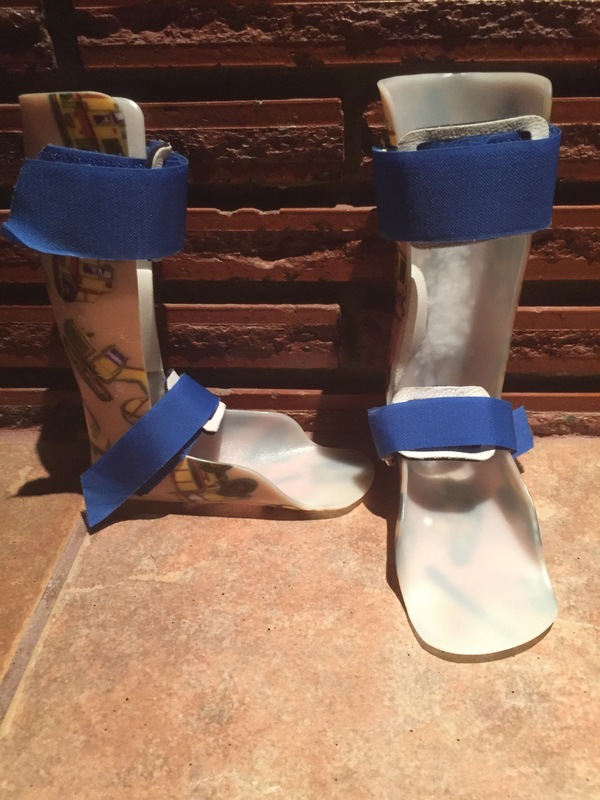 ← Braces, Crutches, Wheelchair, Therapies – And VACATION! I don’t want to scare you by the title. All is good here – really! But that’s what came to me because in my head, the past seven months or so has been me working really hard at ruling out everything I can that was pointing to a tethered cord surgery. And in our minds, tethered cord surgery is one of the “worst” in that it is surrounded by fear for us. 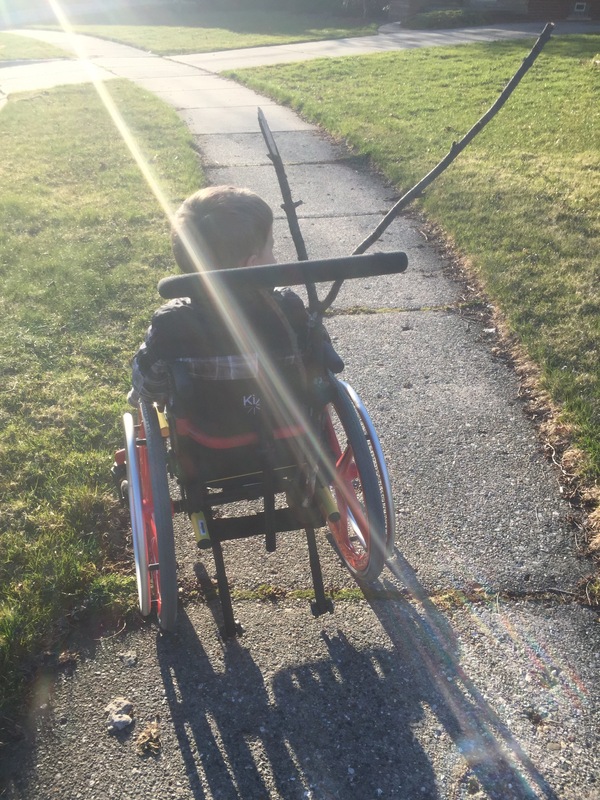 A tethered cord surgery, or a tethered cord release, is pretty common among those with Spina Bifida Myelomeningocele and there are some tell-tale signs that usually lead to a tethered cord release. Some people need releases as infants (rare), many need one during a growth spurt, and some may never one. Every person with Spina Bifida that has had a surgery to close up the spinal cord will have a tethered cord (TC)- that is not the issue. It simply comes with the territory as a result of scar tissue build up. However, NOT everyone will require the TC release surgery. Only those that are displaying symptoms. Some of these symptoms are a change in function (decrease) or gait pattern, change in bowel/bladder function, back pain, fatigue, and a few others. For the past seven months, we have been dealing with quite a few of those symptoms. None severe, but enough that we and the physical therapist have had numerous conversations about the possibility of it. And Richard and I have had many, many conversations about it that do not end well. You see, we have a fear – rightfully so, of this surgery. We have since first learning about it. The surgeons go back into the incision on the back, into the spinal column, and clear out the scar tissue. Well, when they go back in there, sometimes they hit some of the nerves nearby. We’ve heard too many stories of people losing more function due to the surgery. We’ve heard one where a child gained function. It’s a difficult decision for families that have to make it because when a child is symptomatic, it’s miserable and they cannot get better. But you know that the surgery could result in even more function loss. But it will relieve pain usually. Sometimes declining function is restored, sometimes if you wait too long though, you simply lose that function anyhow. So as these issues started to pile up, we have worked hard to fix them one by one. Our biggest issues were the change in bowels, which has mostly resolved over the past couple months – finally, and pain in the legs/hips/back. And that’s what I’m focusing on today – leg pain. We have had four – count them, FOUR pairs in the last seven months. FOUR. He broke through two pairs, and another was “too bendy” – it had articulating ankles – a joint at the ankle that allowed him to more freely bend. These didn’t work too well. Given that he doesn’t have control at all over the right foot and only one direction on the left, it wasn’t really a surprise. Except that all the previous pairs of braces that he broke were broken from bending at the ankle! He has also complained of every pair being bothersome in some way or another. So we felt his body was trying to tell us something and we tried the articulating ankle. As I said, that didn’t work so we went the exact opposite way – a harder plastic solid AFO. This is similar to his other pairs but much, much stiffer – almost cast-like. No bending on these! After a few weeks adjusting to them, we’ve been on a very good road with this pair. We started seeing some breakdown on his inner ankles a couple weeks ago so we took them in for an adjustment and they even shaved down some of the bottom to allow a little bend in the toes as he walks so it’s not such a stiff, flat-footed gait. I don’t often think of the awesomeness of him walking because I am with him every day and it’s hard to look outside the day to day. My dad recently reminded my husband of what the doctors at Mott Childrens’ Hospital said when Colten arrived there the day he was born… To not expect him to walk. That he might possibly do so around the house, a little, but would need a wheelchair once he stepped outside the house. And while he does have a wheelchair to help with long distances, he is comfortable getting in and out of it to be mobile in whichever way he chooses. More on that another day. For today, this kid walks all over the place! And sometimes rolls! His crutch holder makes a great stick holder. 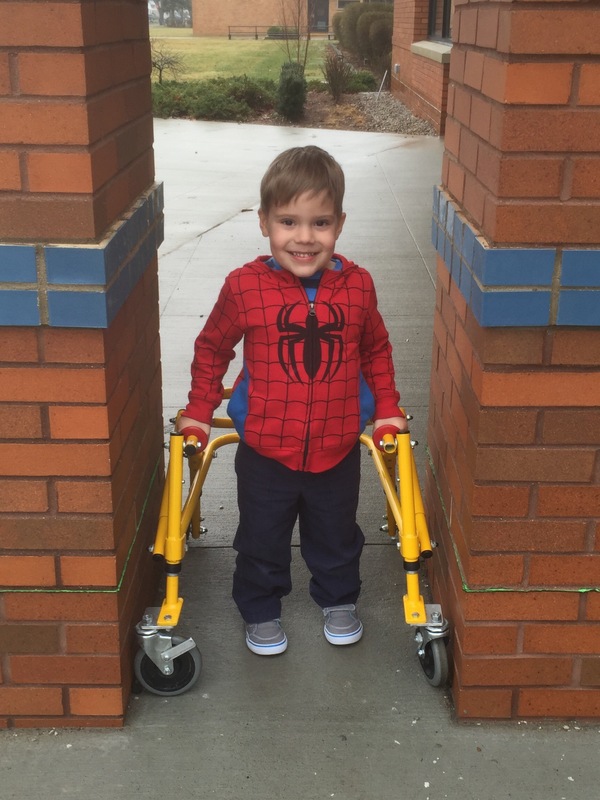 This entry was tagged AFOs, motor development, myelomeningocele, orthotics, spina bifida. Bookmark the permalink. It does sound challenging and fearful—we know any surgery can be, but back surgery, going into the spinal column, Yikes! You folks have a lot on the plus side as you face this decision. Similar to the other commentators, I would add that Colten has achieved amazing mobility given what you were told at the start. This is due in no small part to his smart parents who lovingly challenge him to go the next step as well as having two older brothers who engage him as an equal in all the merriment and mayhem! You all are in my thoughts and prayers. Colten has been on my daily prayer list since his Day One. As always, I stand [or sit!] ready to do anything that I can to help. It was great to see you and Richard at the Cabaret last week. 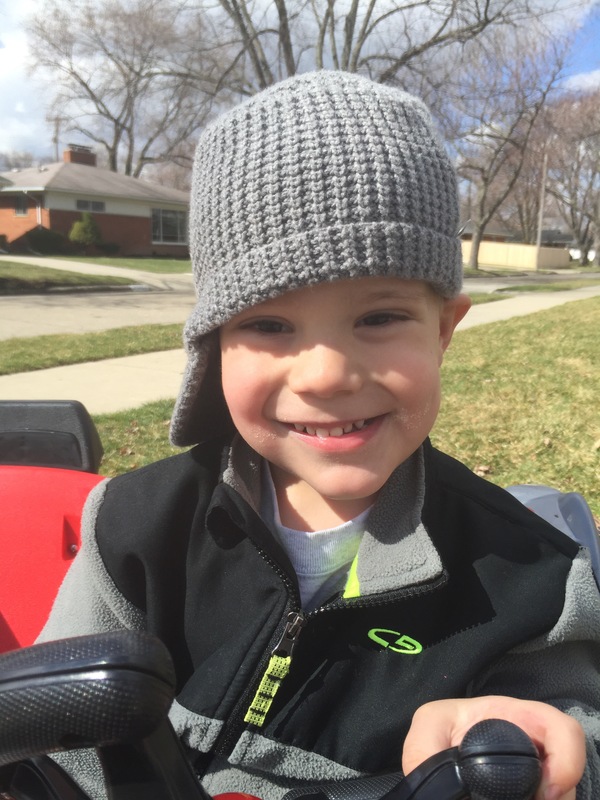 Hi Katie, as usual, I look forward to reading Colten’s story, with pictures that always make me smile. 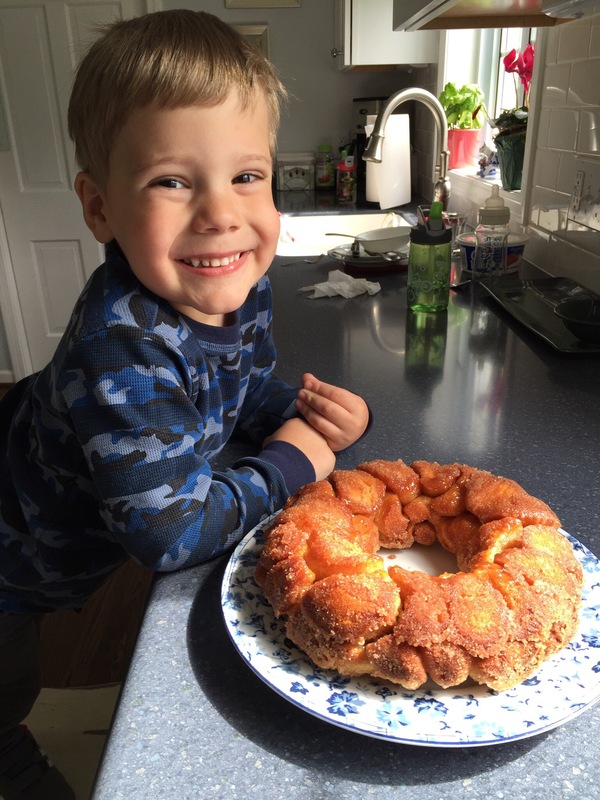 I so remember when this little guy entered this world…….and he’s so lucky to have you and Richard as his parents. You were determined to give him the best care so he could keep up with his big brothers. I’ll keep you and Richard in prayer as you ponder your decision(s). I love him so much. Beautiful boy. Love, love, love to see him walking around 🙂 More steps to come! !